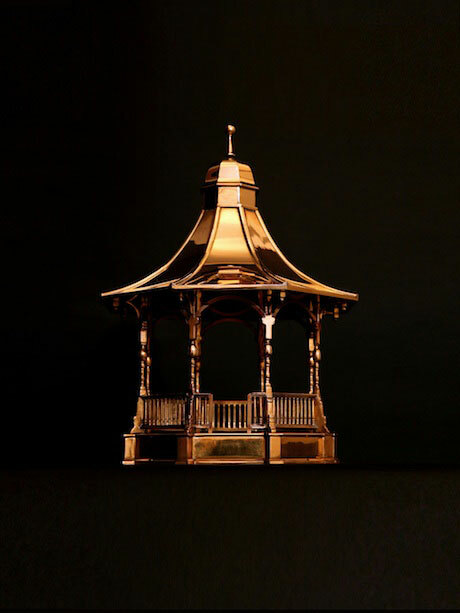 The Brass Bandstand project, seen here as an architectural model, is a reconstruction of a Victorian bandstand made entirely from highly burnished brass. Approaching the sculpture, the viewer is confronted by the dazzling surface reflections; the infinite mirroring between the floor and ceiling, the bandstand's spire reflected and re-inverted in the concaved surface of the roof and the apparent internal lighting or glow that is emitted by the crown-like structure. Echoing the visual characteristics of brass instrumentation, evoking nostalgic images of summer afternoons and lively musical performances, the reflective surface also mirrors the reality of contemporary life around it and reminds us of the historic social changes that have taken place in post-industrial Britain. While this monument is visually luxurious, brass itself is not a particularly precious metal and can be read as the decorative material of the proletariat, reinforcing the democratic intent of the municipal bandstand structure. The proposal for a full-size Brass Bandstand seeks to memorialise the once familiar structure, whilst visually re-animating it to its former working glory and positioning it back into the heart of local cultural interest.